This is a blog to capture my experiences with the Flex 6700. 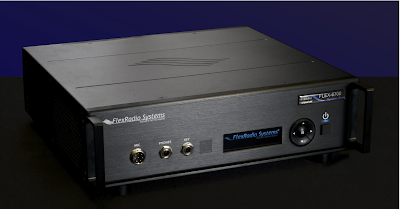 As noted in my general VA7LWE blog, I've had my eye on this rig from Flex Radio for over a year now and I have finally been notified that the radio is on its way to me. I have to confess that my blogging goes in fits and starts... 'other life' presses in! I'll try to make updates as I get news and interesting observations. I suspect that will be more frequent in the early days and it will probably taper off over time. For some reason, Flex Radio seem to have created quite a polarisation of opinion in the market - going from comments on eham. It's difficult to get an objective handle on the comments, but the negative comments appear to be from a mix of ex-owners of Flex radios, people who object to high-prices, people who just don't like Flex Radio for some reason and maybe a few who don't consider the technical direction to be 'legitimate radio'. The fact that the product release has clearly been delayed, compared to early statements from the company seems to have exacerbated negative sentiment. Having worked in small tech companies, this alone does not signal certain doom to me - I'm well aware of the difficulties and tensions in developing and marketing products in a small firm. I'm certainly one of those prepared to keep the faith, but that doesn't change the fact that Flex Radio have to deliver on their promises. I'm also quite happy to use the radio while the software is still pre-production. I've already noted my own motivation and attraction to the ideas imbued in the Flex 6700. To me, a high-quality, highly configurable interface between my computer and the 'RF environment' is something of a nirvana. As a software guy I understand the value in more general purpose hardware and the flexibility and power of doing more in software. However, the RF components and raw signal processing in such a set up have to be exemplary if this box is to actually reach the full potential of Flex Radio's vision, with which I'm aligned. Hopefully, they've got the fundamental architecture and the immutable hardware engineering right. After this, it is 'just' programming: FPGA, DSP and CPU software. If they have right-sized the hardware for the demands of the software that will be required, with hopefully some nice headroom for future additions, then a great radio should eventually arrive even in the event that the current development software is still a little rough. Anyway, regardless of all the speculation, I'm about to get to see where the state of development actually lies. The first few updates thereafter should provide some idea of the development inertia and a clue as to whether this will end up being meeting my hopes and expectations. Now, this radio is defined by software (ha!). So, assuming, as I said, that they got the hardware right, the basic performance of this equipment as a radio and its operational ergonomics are going to be all about the prowess of Flex's engineering team and their mastery of the hardware for high-quality signal processing, along with the design of a highly usable user interface. Invariably, there will be a first pass for many elements of the system to get them into an acceptable level, then I'd expect stepwise refinement to improve qualitative and qualitative metrics, including responses to feedback from the market and users. Naturally, I'll be making my own subjective assessments right from day one, mostly in comparison to my Icom 7800 in terms of basic radio performance. Aside from the fact I'm a Mac user, I expect to take to the control UI very quickly and unless it's actually broken in some way I can see this being absolutely the way I'd like to operate. Of course, I'm hoping that Flex Radio or some partners will eventually release a native Mac or iPad client - allegedly that should be a much more practical proposition as in the 6700 this software is only for command and control - but in any case that's very much a 'nice to have'. Aside from my own subjective assessments, I intend to take the 6700 over to my good friend Adam Farson VA7OJ. Adam is a retired telecom/RF engineer par excellence and continues to actively test transceivers when he can get his hands on them. He has a well equipped lab and has recently been busy performing Noise Power Ratio (NPR) tests on a range of commercial amateur rigs. He has expressed interest in testing the 6700. While published results will have to wait until an official "V1" software package from FlexRadio, nonetheless some early data will be pretty interesting. At the very least a comparison with the Perseus receiver, which Adam has already tested, will be fun.